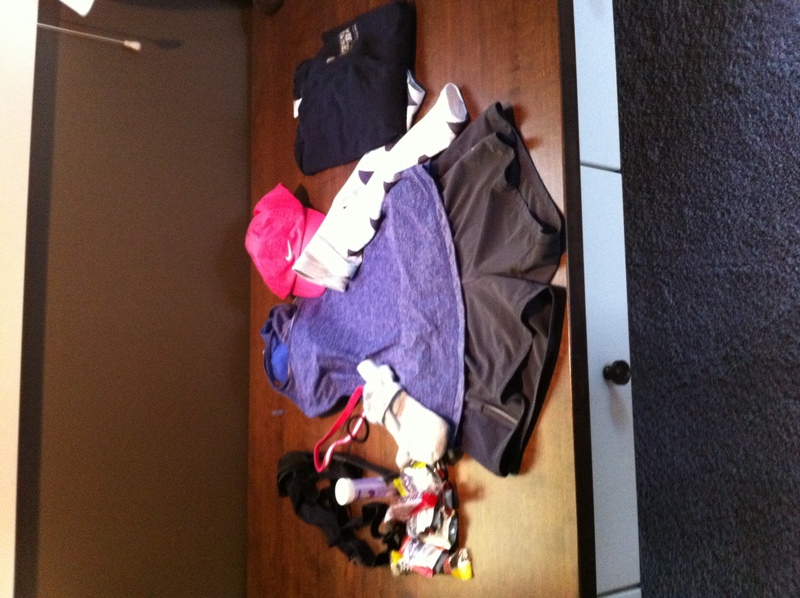 I spent some time this afternoon organizing for the marathon, laying out my race outfit, gu, throw away clothes, etc. I still haven’t checked the weather, but I figure tank and shorts (and maybe armwarmers) no matter what the weather is. I’ll check the weather Friday and modify the outfit then if necessary. Why, yes, I did say that. 7 other times. Right after I cross the finish line. If you are interested in tracking, my number is F5392. Cindi Matt. The website has online tracking (I think it’s usually pretty accurate) or there is text alerts (I haven’t heard good things about this type of tracking). I have my race strategy all thought out. I’m really excited, confident and ready! Hope this week goes fast! Purple shirt?! New training = new racing color??? I like it! Ha! But notice the pink headband and pink hat?? Still gotta have me some pink!